In the WHATEVER AFTER SERIES, brother and sister Abby and Jonah have a magical mirror in their basement. The fairy Maryrose was cursed and forced to live within it. With Maryrose's power, Abby and Jonah enter the fairytales we've all come to love to see if they can break Maryrose's curse. 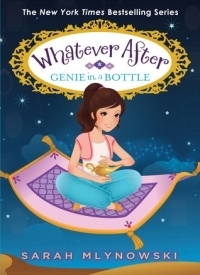 In GENIE IN A BOTTLE, Jonah and Abby enter the world of Agrabah and into the story of Aladdin and Jasmine. What better place to try and free Maryrose than somewhere with genies? Except as usual, everything goes wrong and they wind up stuck with a rookie genie. Jonah and Abby need to fix the story or else Jasmine and Aladdin won't even meet. I really liked that the author stays true to the original story of Aladdin instead of the Disney movie version. I also really love how it ended and it makes me want to read more from this author. This is perfect for young fans of fairytales. Final Verdict: This was a very fun and entertaining read that puts a new twist on the fairytales we all know. I recommend this to fans of fairytales and fantasy.